Providing you the best range of horizontal laminar air flow and laminar air flow horizontal with effective & timely delivery. We offer Horizontal Laminar Flow manufactured on the basis of industrial standards and norms so as to ensure excellent functioning and reliable performance. Presented air flow models are made available in a laminated finish and have aluminum framed high efficiency particulate air filter and washable type pleated pre-filters. 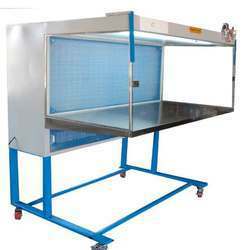 We offer these high performing and reliable horizontal laminar flows at affordable rates. Construction: Models available in laminated finish / 18 gauge stainless steel 304. Noise level: <65 DB measured at 1 meter from filter face. Laminar air flow provides ISO class 5 (Class 100 U.S. Federal Standards 209E)environment within the work area that complies with the latest IEST recommended practices. Perforated stainless steel diffuser screen products the HEPA filter and maintain uniform air flow velocity within the work area. Easy disassembly for access through a small door. Filters: Aluminum framed High efficiency Particulate air (HEPA) filter, with a minimum efficiency of 99.99% at 0.3 micron. Pre filter: Washable type pleated pre-filter with 90% efficiency. Motor / Blower assembly: Direct drive, continuous duty ¼ HP with sealed bearings. It is mounted on FRP casing to reduce noise & vibration and is dynamically balanced. 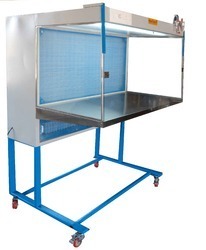 In order to fulfill the varying demands of medical industries, we are engaged in offering a quality range of Horizontal Laminar Air Flow. This Air Flow is used to provide protection within the work area. The work area is confined by removable clear glass panels, and the work surface is of stainless steel. We deal in Laminar Air Flow Horizontal which is made available in various models classified on the basis of power consumption, net weight and operating voltages. Offered products provide high protection of products in the work area restricted by removable glass panels and stainless steel work area. These air flows allow an easy disassembly for access through a small door. Looking for “Laminar Air Flow”?